Easy to follow chapters give you a step by step guide to the whole process of preparing for your open house and sale. 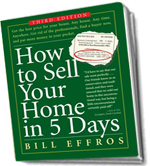 Featuring copier-friendly worksheets, telephone logs, checklists and newspaper ads as well as an essential "What To Do If..." chapter, "How to Sell Your Home in 5 Days" is essential to get started to sell your home fast. Click here to learn more. These dynamic yard signs literally drive traffic to your front door! 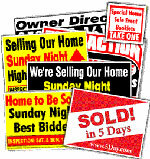 Used in hundreds of successful 5 Day Sales nationwide, these signs make a unique and powerful statement about your sale to get buyers in and sell your home fast. Click here to learn more. Measuring at 5 feet wide, these signs can't help but attract the attention and traffic you need for your 5 Day Sale open house! Double-sided graphics ensure your message is always visible. Click here to learn more. This is mission control for your 5 Day Sale! Gives you complete, online access to George's entire 5 Day Sale database of time-tested documents and instruction guides on how to sell your home in 5 days! Find out what you need to do next in just minutes! A clean, user-friendly appearance makes logging on and viewing your 5 Day Sale documents and checklist super-fast and easy. Click here to learn more. Over 70% of home buyers use the Internet to search for homes! A 5 Day Sale website gives you an impressive web presence, expands the reach of your sale, and increases the number of informed and motivated buyers coming to your house. In today's market, a website is a must have to sell your home fast. Click here to learn more. Informative, personalized, and colorful indoor signs in each room will practically give the open house tour for you! It's so easy… the signs come ready to use. Simply personalize, print out, and post in each room! Click here to learn more. This is a time-proven, well focused group of publications designed to inform your home buyers of your upcoming 5 Day sale. You can't miss when you sell your home fast with these professionally designed collateral materials. Click here to learn more. Proven effective! This letter is filled with informative copy that answers the number one question — "why sell your home in 5 days?" — and gets the news about your sale out to the precise demographic interested in your home within a 1 to 3 mile radius of your address. Click here to learn more. Large, effective 8.5 x 5.5 full color postcard with a photo of YOUR HOUSE on the front of it is mailed out to the precise demographic interested in your home within a 1-3 mile radius of your address! Click here to learn more.